The Bull's Blood Festival in Eger has a unique attitude that you cannot experience anywhere else. We gather together, listen to some good music in a beautiful environment and drink our excellent wines. We all will have a great time, for the 22nd time now. Bull's Blood is produced with great care, it is a high quality, suberb wine that is very versatile thanks to the fact that it can easily be blended. However, it has not lost its typical Eger taste over the years. White and rosé wines are similar to red wines of the area in this respect, they represent the harmony of the habitat and the varieties of grapes that are native to this land. Fruity flavours and dynamic acids are also characteristics of these excellent products. 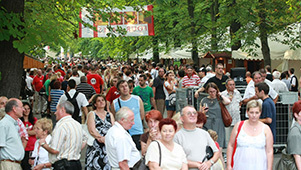 The Festival has an old and popular tradition: the food is prepared by the best chefs of the town and its neighbourhood. The dishes you can try there are always creatively composed for this special occasion. 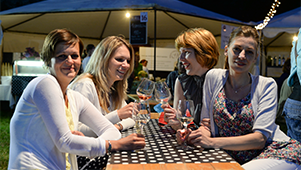 One glass of Bull's Blood, and one Eger meal – they together create a true wine festival atmosphere. You can enjoy a wide variety of musical productions on two stages, and a unique scenery in the Érsekkert. You will find that it is really a great way to relax! There will be performances form some popular Hungarian bands on the stage called the 'Egri Bikavér' (named after the famous red wine, the Bull's Blood). This is where you will be able to see the main attractions of the festival as well. 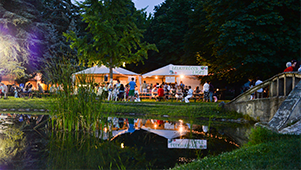 There will be another stage at the bandstand, the 'Egri Csillag Stage' (named after the white wine) where you can enjoy the musical and cultural attractions of local DJs and their guests. In addition to all the above, you can take part in various kinds of programs, we lay a lot of emphais on visual culture and the comfort of our younger guests and families. The festival also offers an attraction to the lovers of big machines and cars. You can also visit our veteran car exhibition and we offer a pet zoo for the young. For the detailed description of our programs please see the Programs menu.